Good afternoon peeps.I dont know about you but i am frozen today,the temperature here in Yorkshire has really changed.On to today's card,I have used a smashing image From Karen's Doodles.I have coloured him with promarkers and added flower soft for the fir trim on his coat and hat.I used an edgeability on the silver and red card,i embossed the silver with the snowflake cuttlebug folder and added some red ribbon and a bow.For the corners i used the same folder and cut them out with a scalloped square nestie .The same folder was used on the red card and cut with a scalloped circle nestie which i then cut in half and mounted behind the image. Oh this is SO cute!! The doggie is adorable! and colouring is fab - love the fur trims. 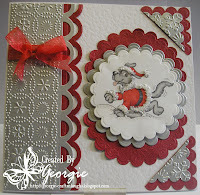 Beautiful embossing and borders - Stunning card! It has gone really cold here too in Manchester!!! Hope you can stay warm - keep crafting!! This s is so cute! Love the Santa dog (I used it too!) This card is so cte and fun. Lovely embossing, too! Thank you so much for playing along with us at Karen's Doodles this week! Good luck in the challenge! Great use of textures and colors to create this too cute of a card! Thanks for joining us at Karen's Doodles Celebrate with Santa. Love this image, fab card! Thank you so much for playing along with us at Karen's Doodles this week! 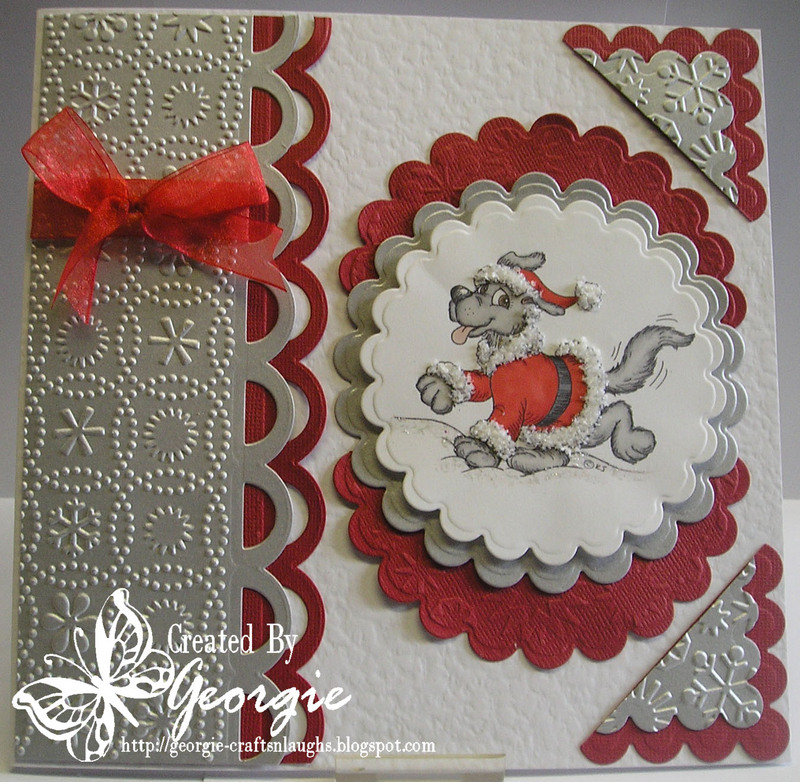 love the dog and the embossing on your silver paper...very classy looking...thanks for joining in the Shopping our Stash winter or Christmas challenge this week! Georgie, this is lovely! Terrific color combo and excellent "fur" trim on the Santa suit :) I am so glad you joined us this week at Shopping Our Stash.